You may remember last year’s Pepsi flavor, Ice Cucumber Pepsi, that took Japan by storm was forgotten after a few weeks (thanks). 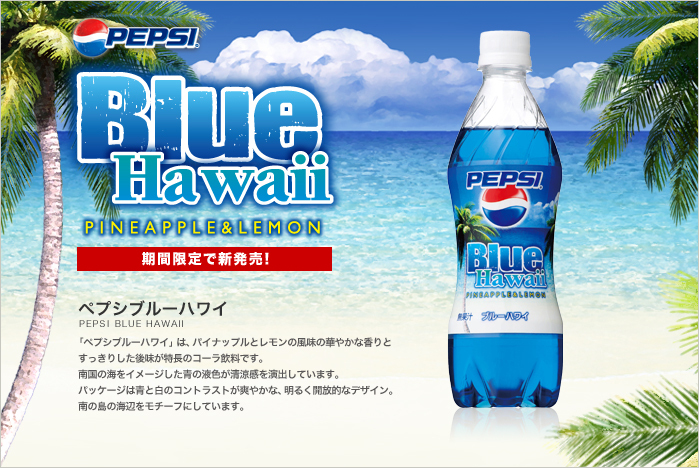 Today, Pepsi has released their new summer flavor called Blue Hawaii. The taste? This time Pepsi went with fruits as opposed to a vegetable. It tastes like a mix between pineapple and lemon. Maybe later on in the season, Peter from JList will put a few cases in his inventory so we can enjoy a taste of Blue Hawaii in America. Via Japan Probe. UPDATED: Billy from 7:10 to Tokyo just went out and bought a few bottles of Pepsi’s Blue Hawaii. Check his review of Blue Hawaii to see what he thought of it.